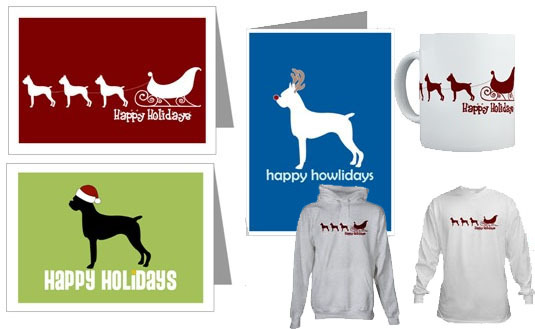 Our section Boxer Christmas Cards and Decorations has been renewed and MOVED ! 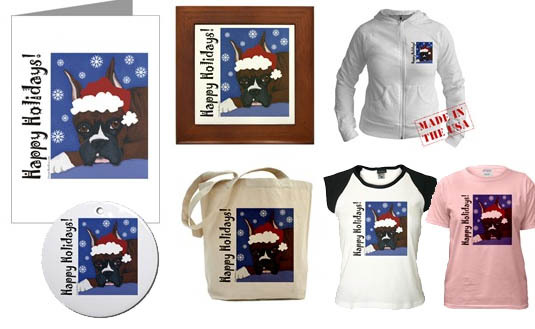 Click here please to visit our new page, with even more Boxer dog christmas cards and ornaments! 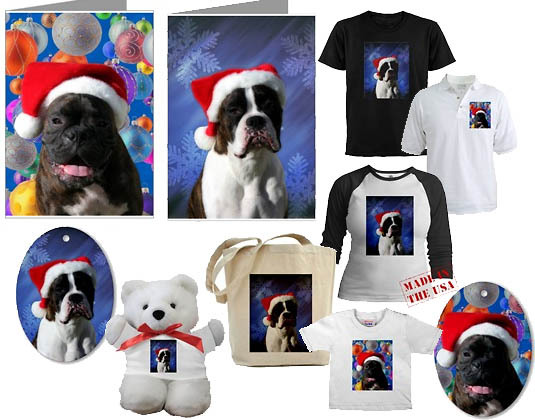 On this page you'll find Boxer Dog merchandise, directly related to Christmas and New Year. 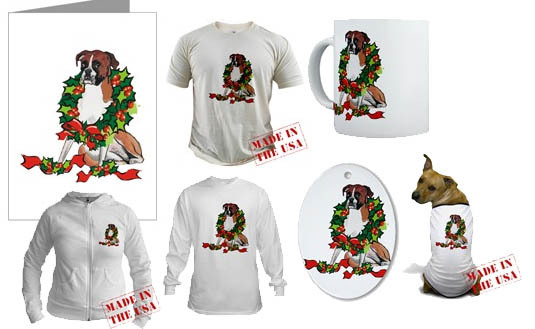 If you're searching for a Christmas gift for a Boxer dog lover, click here to choose another category if you prefer (i.e. 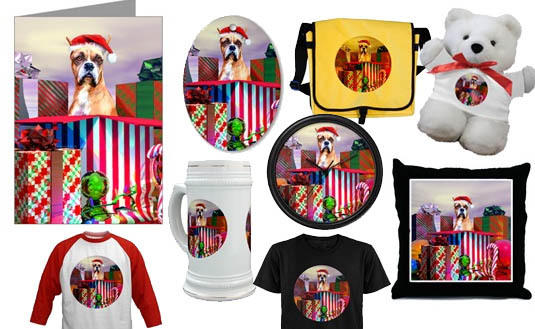 Boxer art, Boxer cookie jars, etc.). Boxer dog christmas ornament with treetopper (tree topper), christmas cards or card, and cards with holiday, holidays or season's greetings, x-mas greeting cards. Christmas (X-mas, Xmas ) Card Collection. Chrstmas or Chistmas. 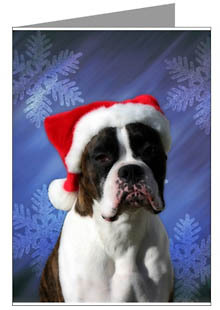 Our section Boxer Christmas Cards and Decorations has been renewed and moved! Lovely artwork by artist Jean Fitzgerald. Choose between cropped ears or natural ears. Add a special and unique ornament to your tree this holiday. Our handmade oval ornament is made of high quality porcelain. It measures 2.3" x 3.25" with red ribbon included. 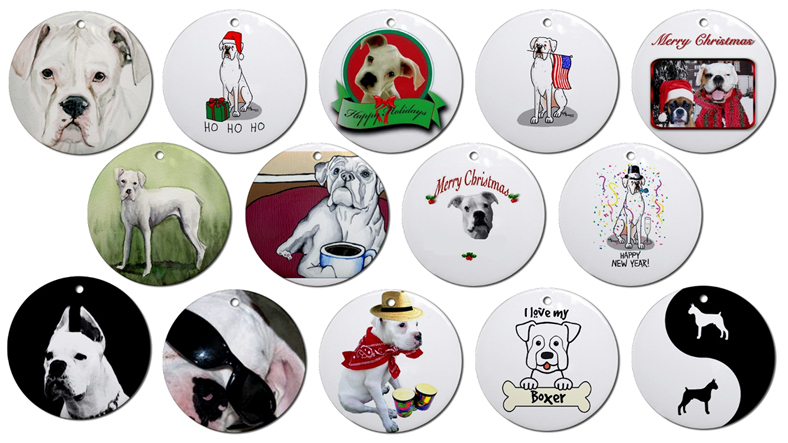 This is just a selection of 166 different designs available on White Boxer Ornaments. 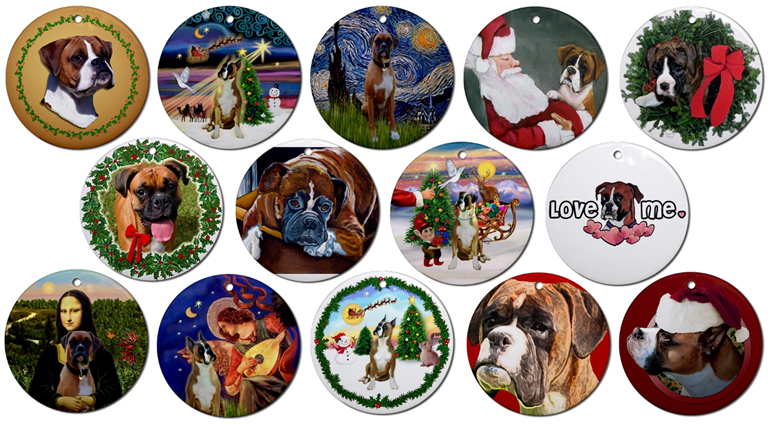 This is just a selection of 2140 different designs available on Boxer Ornaments. 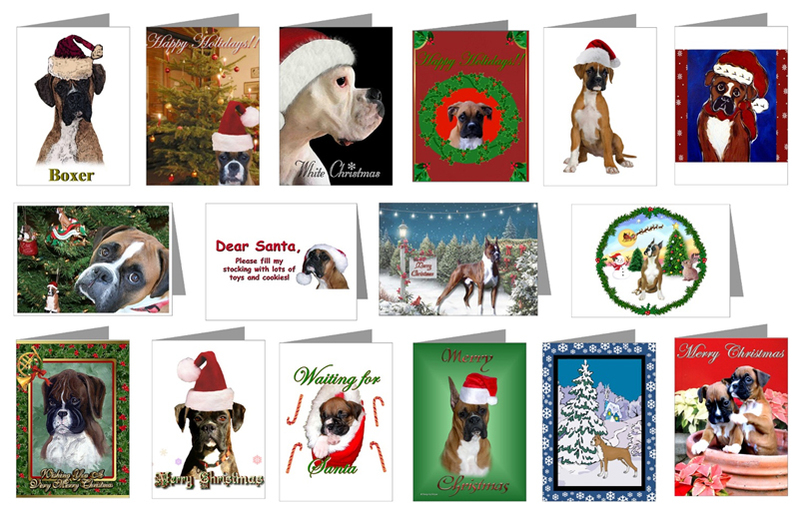 This is just a selection of 497 different designs available on Boxer Cards. 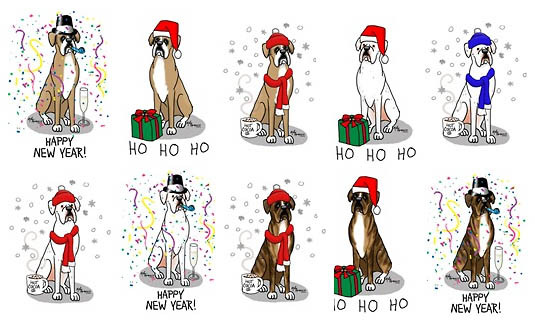 With images drawn from a quarter-century of experience, renowned canine artist Ruth Maystead captures the spirit of Christmas with Boxers in a boxed set of notecards. 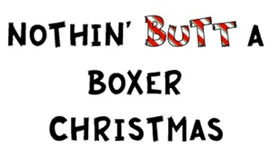 Each set contains six identical 4 1/2" x 5 1/2" blank Christmas Boxer Trio cards with envelopes. This Boxer family sends their greetings. Inside: "May your Holidays be filled with warmth and love." Each box contains 12 cards with envelopes. Approx. 4.5" x 6.75"
Front: "Happy Holidays" Inside: "Warmest wishes for a bright and happy Holiday" Box of 16 cards with envelopes. A Christmas plaid toe adds a unique touch to our Boxer needlepoint stocking. Measures 17" long. 100 percent wool needlepoint design. 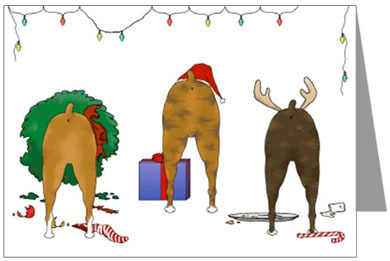 Deck the halls with fur and laugher this holiday season. 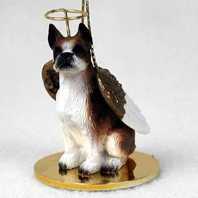 A pint-sized resin version of your favorite breed wears a tiny jingle bell and dangles from beneath a bone shaped nameplate, making this ornament a much nicer way for your dog to mark the family tree as his territory. Bone nameplate is shown with a removable sticker, but is intended to be personalized at home with your own dog's name. Handpainted resin ornament hangs 6.5" long and measures 2.5" wide. A Santa-hat bedecked Boxer brings joy to all in this handpainted resin and glitter Christmas ornament. Ornament measures approximately 3.5" x 4" and comes with a festive loop of gold thread for hanging. 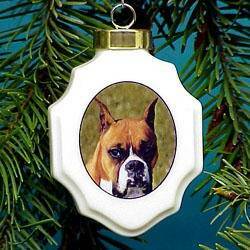 A beautiful holiday wreath encircles a Boxer's face peering from this Holiday Buddies Ornament. 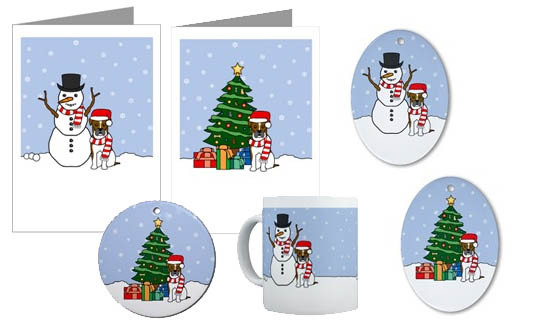 Hang it on your mantel, Christmas tree, in your window, or anywhere else you need a little more Holiday Spirit! 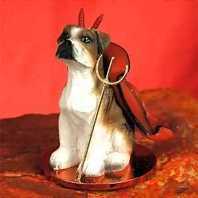 Approximately 4" x 4"
This adorable Boxer is wrapped snugly in his red scarf and would love to have a spot on your Christmas tree. Measures approximately 2" tall. Delight your family this holiday season with our scrumptious new line of gingerbread house tree decorations. 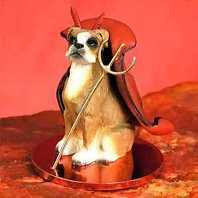 Made from resin, this miniature sculpted display positions your favorite breed next to the doghouse of his dreams. Also, ribbon can be removed to use figure as a tabletop decoration instead of hanging. Ornament measures 3.25" high. Nestled in a green and gold striped gift box, this resin Christmas pup will charm his way onto your family's holiday tree. Ornament measures 2.5" x 2.25" x 2.5" tall. Bundle up in your coziest scarf for a sleigh ride around the family tree. Made from resin, this miniature sculpted display positions your favorite breed inside of a sleigh fit for Santa. Ornament measures 3.25" high. Available with Natural ears and Cropped ears. A tiny BREED's face and paws peep over the edge of this attractive red plush Christmas stocking, and the delicate loop of ribbon is perfect for hanging from the family tree year after year. Approximately 4" long. A furry face peeks out of a doghouse in this darling Christmas ornament that also features a blank nameplate, perfect for personalizing at home with your furry friend's name in Sharpie or craft pen. Resin Christmas ornament measures 3" x 3" and comes with a festive loop of ribbon for hanging. A fun and unique gift for lovers of this breed, our candle base features a circle of furry merrymakers dressed in their holiday best and surrounded by snow and evergreens. This candle base is sculpted in resin and handpainted, and can hold a 3" candle (not included). Base measures 4.5" wide and 2" high. 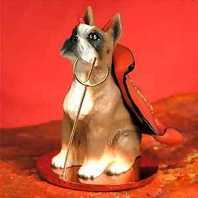 Proudly display your favorite photo of Fido in this tiny resin frame, and use craft pens or Sharpies at home to write his name in the place of honor above the doghouse doorway. Hang the ornament from your tree at Christmas and then remove the ribbon and stick this magnetic frame to your fridge for the rest of the year! Photo Magnet/Ornament measures 3"H x 3.5"L x 0.5"D; holds a 1.25" x 1.5" photo. Dressed up as a soldier in a smart jacket, hat, and boots, this little nutcracker version of your furry four legged pal is sure to be the highlight of your family Christmas tree year after year. Sturdy handpainted resin ornament measures 5" high and 1.5" wide; completed with a coordinating loop of cord for hanging. Please note that uniform's colors are assorted per breed; may vary from product pictured here (Dark Green, Light Green, or Red). Won't Santa give a dog a bone? This little chap has "borrowed" Old Saint Nick's hat and is waiting patiently to make a trade. Sandicast's sculpted resin Boxer with cropped ears boasts impressive detail and character for its size (approx. 4" high); includes loop of gold thread for Christmas tree display. 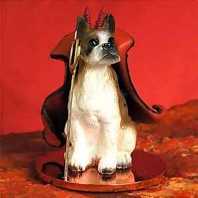 A sculpted Boxer proudly clasps a nameplate with his paws in this clever resin ornament. Resin plate is left blank for you to personalize with your favorite furry pal's name, and a gold loop of fabric ribbon is attached for hanging from the family tree. Ornament measures approximately 3" wide by 2"high. Sharpie/permanent marker recommended for smudgeless personalization at home. 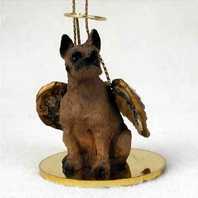 Fun for dog lovers whether displayed on top of the family Christmas tree at winter or as an eye-catching table accent year-round. 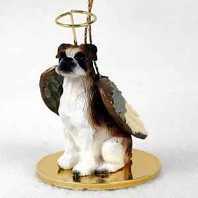 These wonderfully detailed dog angels are handmade in the U.S. and measure a generous 12" tall. Shipped directly from the manufacturer; please allow 2-4 weeks for delivery. **Note: Because this item is handmade per order by a small group of artisans, we cannot assure delivery by Christmas after Dec 2. These wonderfully detailed tree toppers are handmade in the U.S. and measure a generous 12" tall. Please allow 2-4 weeks. Bouquets may vary. **Note: Because this item is handmade per order by a small group of artisans, we cannot assure delivery by Christmas after Dec 2. A perfect hiding place rests beneath the feet of this Boxer. Porcelain trinket box is hinged and measures approximately 2.5" high. 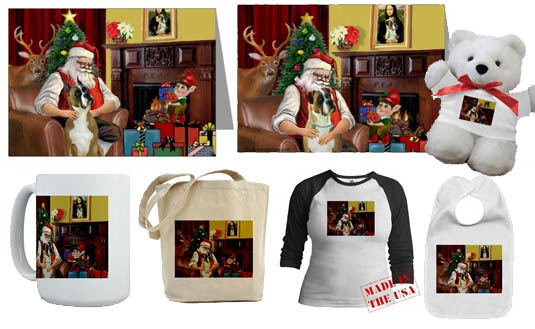 Perfect as a Christmas gift or a place to hide a Christmas gift. We are proud to introduce the newest product in our Living Stone line&endash;AKC inspired miniature glitter globes. These tiny collectibles combine the extrodinary breed standards of the AKC and the unsurpassed quality of Living Stone. The globes measure 2.5" high and 1.75" wide. This tiny Boxer puppy glitter globe combines puppy charm and the quality of Living Stone for an irresistible addition to your collection. The resin globe measure 2.5" high and 1.75" wide and features a beautiful woven basket effect on the base. 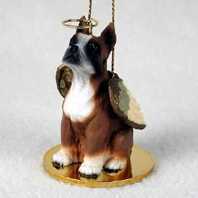 Give your Christmas tree decorations a unique look with this wonderful Boxer Christmas Ornament. 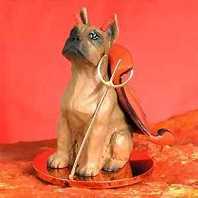 Made from quality porcelain, the Boxer dog Christmas Ornament will help make your holiday season special. 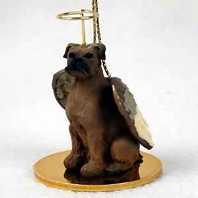 This collectible series Boxer Christmas Ornament has the full color dog image on both the front and the back side of the ornament. 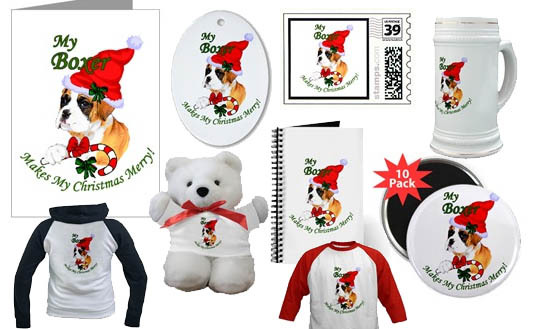 Each Boxer dog Christmas Ornament comes individually packaged in a nice gift box. 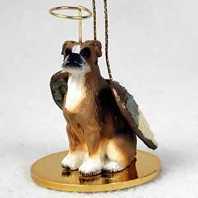 The beautifully designed Boxer Christmas Ornament is approximately 2 1/8 inches wide x 3 3/8 inches tall x 7/8 inches deep. Hand-painted figurine on a base with wings and a halo. 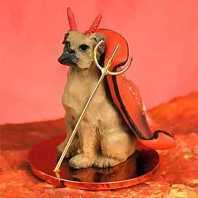 Hand-painted figurine with Horns, Cape and a Pitch Fork. --BOOKS --Books about Boxer dog training, behavior, breed history. Children's books, too! * Please note: we strive to keep the prices named here up to date. However, the price stated at the seller's site will always be the price you'll actually pay.